Declare your love and admiration to a very special woman in your life with a glamorous basket filled with sweet and fresh blooms including pink roses, white gerberas, pink carnations and gypsophila. 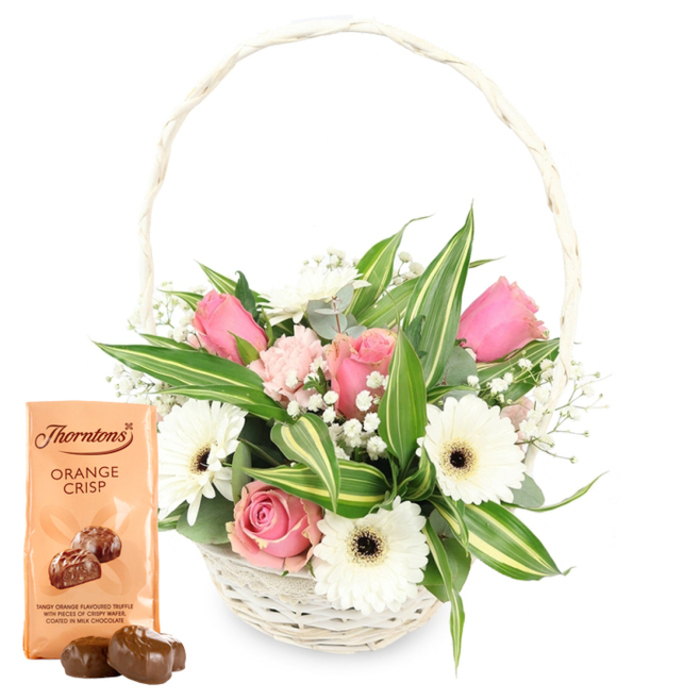 Send a charming gift of flowers and candies that will make her day! Original size contains approximately 10 stems. Grand size contains approximately 20 stems. They have great a variety of both local and exotic flowers. The flowers I have received have all been spectacular. Job well done. My cousin was delighted to receive this basket. The card and the message were amazing. Thanks a lot, we will use you again! Baskets of flowers are super cute, aren't they? I wanted to make a special present for one of my closest friends and ordered this basket. It arrived on the next day. Won't ever order from another company. You are the best! Loved this basket right when I saw it on the website. I must say that it was even more amazing when I got it delivered. Fresh and vibrant flowers that complemented each other just perfectly!